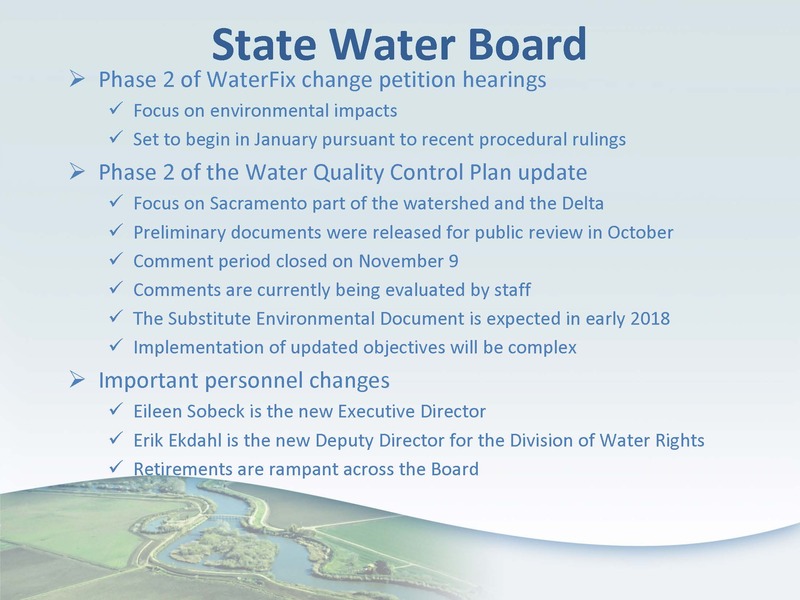 At the November meeting of the Delta Protection Commission, Delta Watermaster Michael George gave his quarterly update to the Commission on the activities of his office and the State Water Resources Control Board. 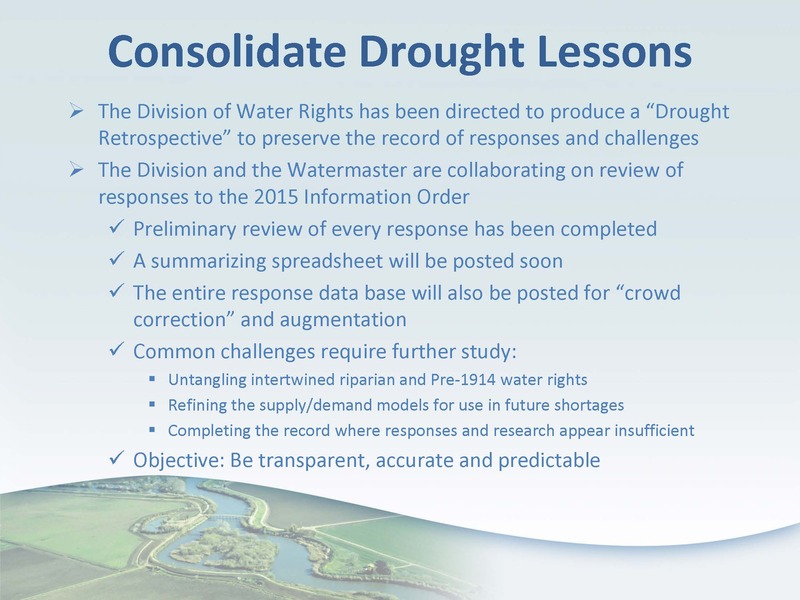 In his presentation, he discussed the consumptive use study, an update on the activities of the State Water Board and the Delta Stewardship Council, implementation of the WIIN Act, and an update on a report to consolidate lessons learned from the recent drought. The consumptive use study is a study of different methods for estimating consumptive use as it applies in the unique setting of the Delta. Mr. George said that understanding and being able to measure water use in the Delta is important, because on the regulatory side, in-Delta consumptive use is part of the regulatory structure under D-1641 that governs the activities of the export projects. The two-year study is winding down. 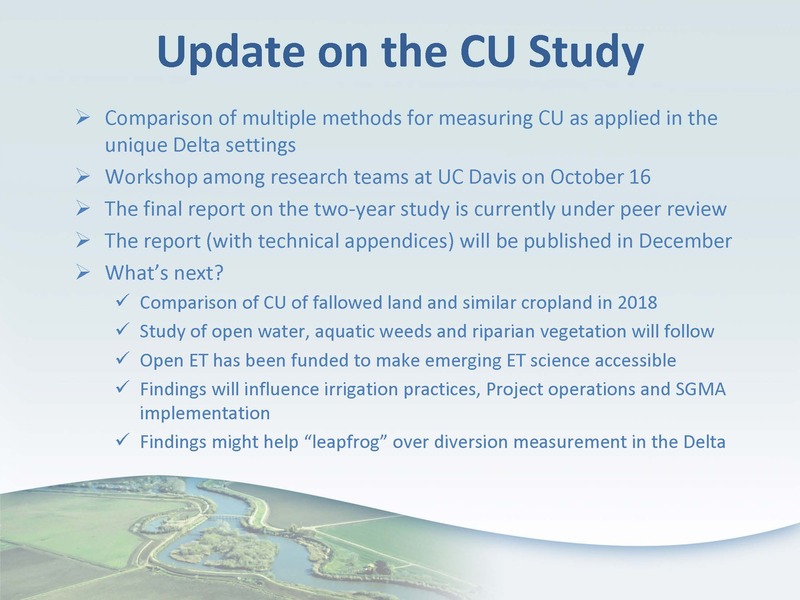 In October, a workshop bringing together all seven of the research teams was held in UC Davis to finalize the study results; the report and the appendices have been sent for peer review; a 50-page report will be published in a peer review journal, possibly even as soon as January. The study looked at consumptive use of crops in the Delta, getting into much more detail and real-time data rather than just what the water use is on an annual basis. Next, there is a need to better understand the consumptive use of water on fallowed land, because land in the Delta has a significant consumptive use, even if there is no crop on it. 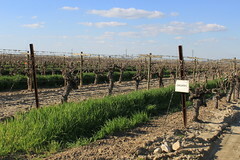 In 2018, there is a study organized for 2 to 4,000 acres on land volunteered by Delta farmers to set up a comparison of water use between a well-managed fallow parcel next to a similarly well-managed agricultural crop so that they can look at different elevations and different areas in the Delta, and understand the consumptive use of fallowed land. It’s also clear from the study that significant amounts of water in the Delta is consumed through evaporation from open water, from riparian vegetation, and from invasive weeds and species. Mr. George noted that it appears that the consumptive use of hyacinth is 4 to 6 times the amount of evaporation from open water, so understanding the changes in freshwater demand as a result of changes in land use are the next things that the study will be looking at. They are also working on a project called Open ET that will make evapotranspiration data available on cellphones so farmers can know what the ET is on a daily or even more short-time basis. “We think that will be extremely helpful in terms of management of Delta water use and system water use as we go forward,” he said. Mr. George then turned to the activities of the State Water Board. He noted that Phase 2 of the Water Fix proceedings which will consider environmental impacts will start in January with hearing dates stretching out through July. 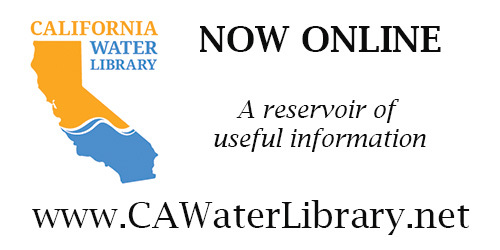 Perhaps more importantly is Phase 2 of the Water Quality Control Plan update which focuses on the Sacramento River, the eastside tributaries, and water use in the Delta. Preliminary documents were released in October; with the comment period now closed, staff is now reviewing comments. Mr. George noted that how the updated standards would be implemented is not included in the report, although he acknowledged at this point, it’s a bit premature because what those standards we don’t know yet what the standards are going to be. “The documents that we see today talk about what the water quality objectives are and how the State Board anticipates framing its balancing of various water uses throughout the Delta watershed, but it doesn’t tell the story of how those objectives are going to be implemented and I would say that’s an important thing to pay attention to as we go forward,” he said. 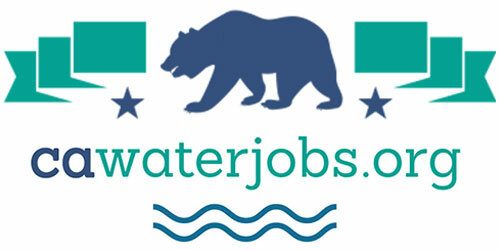 He also noted there have been significant personnel changes at the State Water Board. Executive Director Tom Howard has retired and has been replaced by Eileen Sobeck. Erik Ekdahl is the new Deputy Director of Water Rights, replacing the retiring Les Grober; his deputy in the enforcement division is Judy Lazatto. 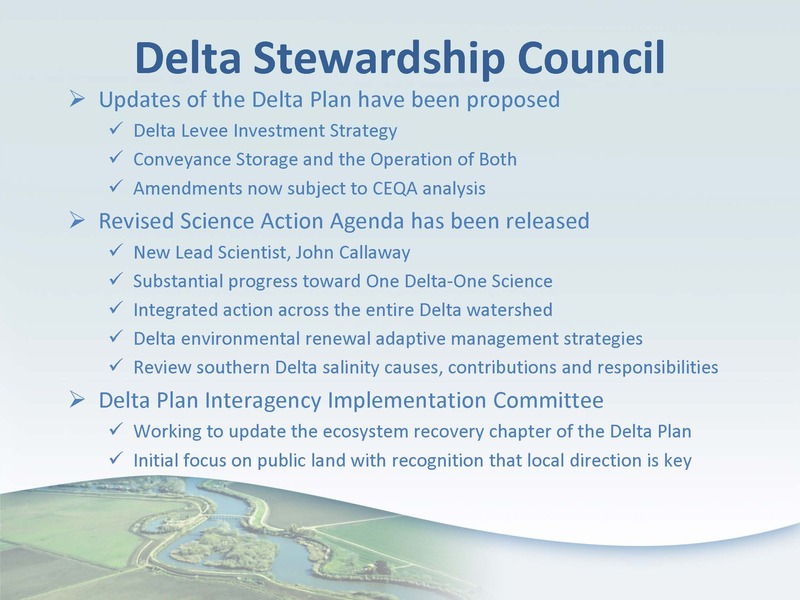 The Delta Stewardship Council has proposed some amendments to the Delta Plan, first adopted in 2013, including amendments for the Delta Levee Investment Strategy and for the Conveyance, Storage, and Operation of both. Those amendments are now undergoing public review of the CEQA documents. In addition, the Delta Stewardship Council’s science program has revised the Science Action Agenda. Dr. Cliff Dahm has retired as lead scientist, and Dr. John Calloway has replaced him. Since the Water Infrastructure Improvement Act or WIIN Act was passed last year, the federal agencies have been working to figure out how to actually implement the law. 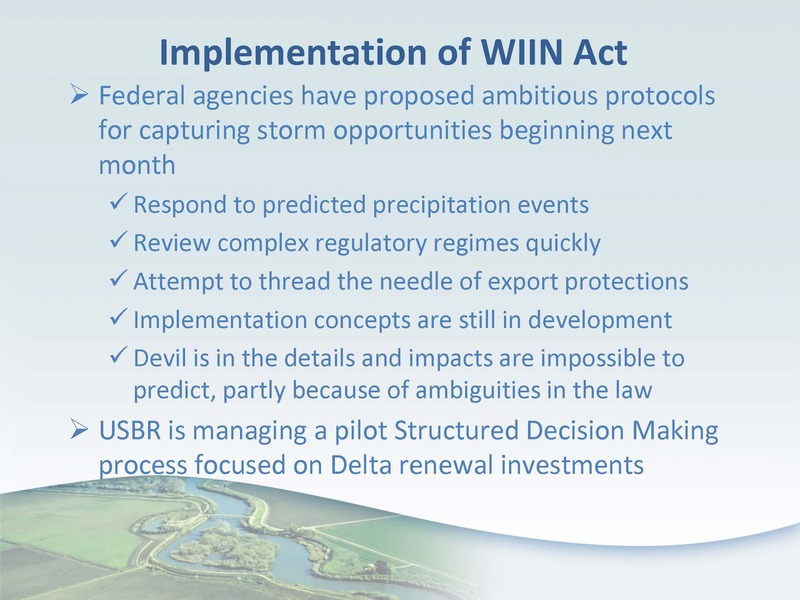 Mr. George said the biggest challenge is the requirement in the WIIN Act to capture as much winter storm flows as possible. This requires real-time implementation of whereas in the past, they had months to do the analysis and decision making. 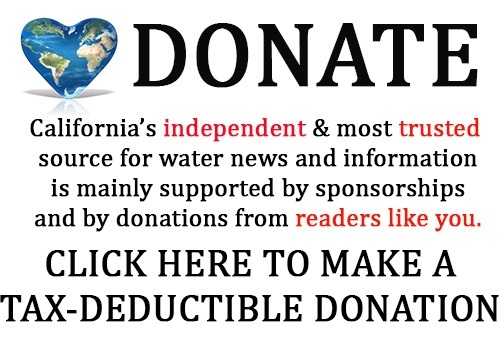 Mr. George said that the State Water Board is working to consolidate the lessons learned during the drought into a retrospective that will cover the actions they took during the 2012 – 2016 drought and what was right/wrong with their response; how they reached the conclusions they did; and the models they used and what can be done to improve them. The overall sense is that during the last drought, the State Board was information and insight data poor, he said. The State Board plans to publish their preliminary conclusions in early December. “The idea here is to get it out, say this is what you told us, this is our analysis of it, tell us what we got wrong, tell us what we’re missing, if there’s more information that has come to light or more analysis that you’ve done since 2015, when you had to put all this together in a very short time frame, now is the time to come forward with it, and we’re going to try and get that crowd correction and augmentation,” he said.